Last year, I ran an unusual Yesterland article about a plastic house inspired by a plastic house. 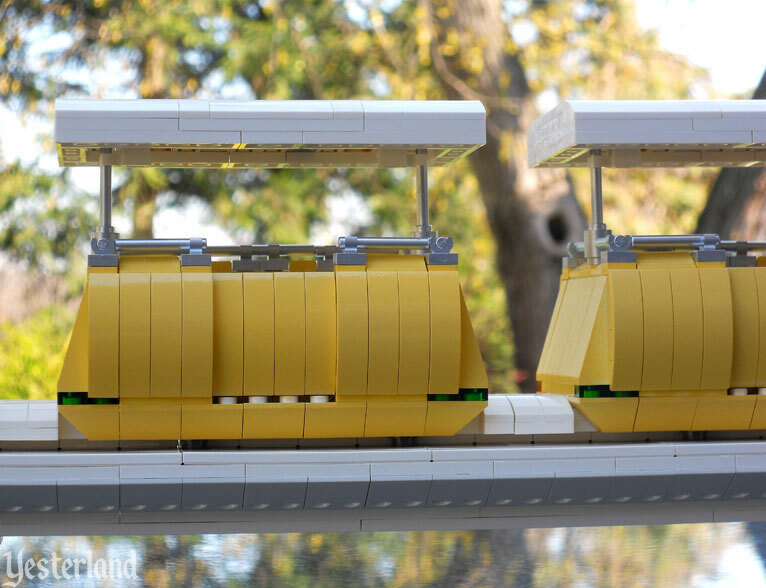 LEGO artist Andy Baird had built an elegant LEGO version of Disneyland’s Monsanto House of the Future. He hoped I would enjoy his photos of it. I did! So I shared them with Yesterland’s readers. As a result of the article, the 2015 Los Angeles County Fair displayed the model as part of its POPnology exhibit. Some people own far more LEGO bricks—and have far more skill in using them. Andy Baird is such a person. 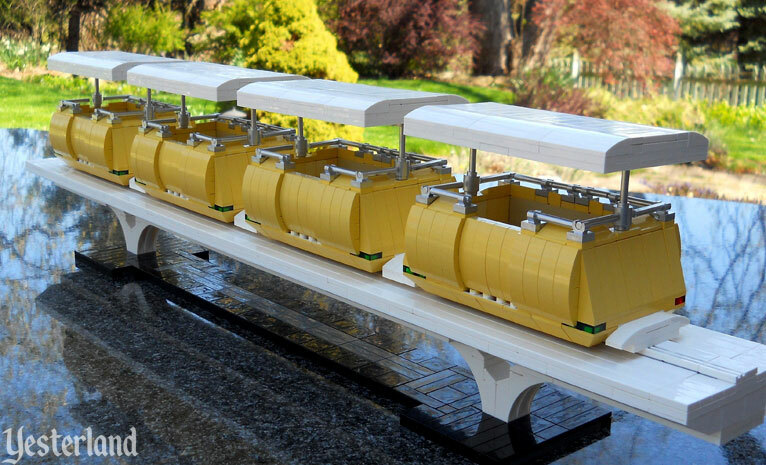 His latest project involved yellow bricks of various shapes—an appropriate color, given two PeopleMover cars that many people saw in 2015. 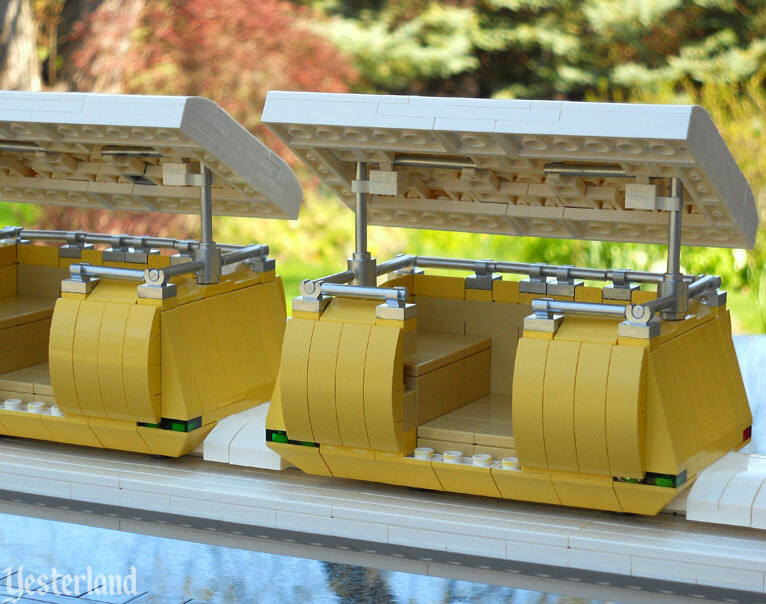 Werner Weiss: What inspired you to pick the PeopleMover as the follow-up to your LEGO House of the Future? Andy Baird: There are certain attractions throughout Disneyland’s 60 year history that have become icons all their own. The House of the Future and the PeopleMover both fall into that category. Bob Gurr’s iconic modern design added a futuristic dynamism to Tomorrowland which captured the imagination of guests for decades. Multiple generations of families had the chance to share in this classic attraction which adds to its iconic status. 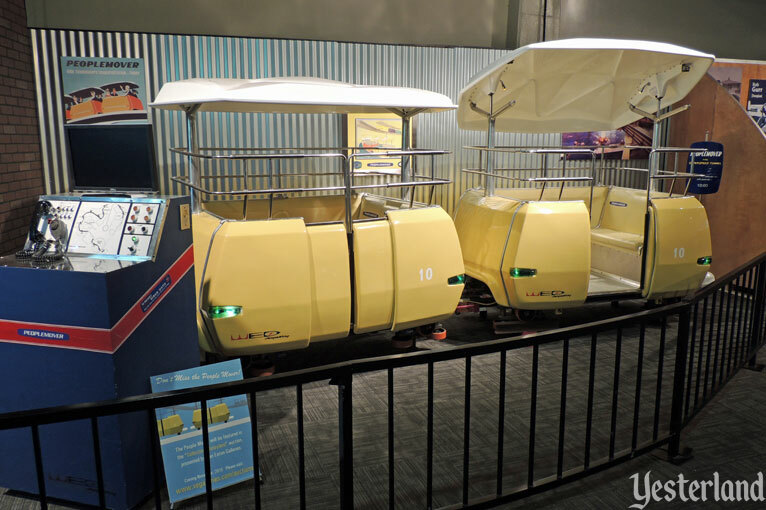 I enjoyed the opportunity to research and get hands-on with the PeopleMover and really sink my teeth into a Bob Gurr original! 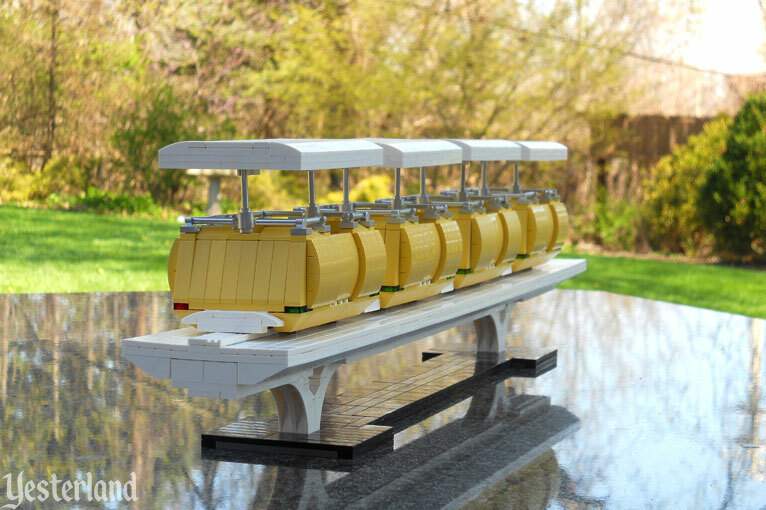 WW: Your LEGO PeopleMover model is so appealing; it makes me want to go for a ride. 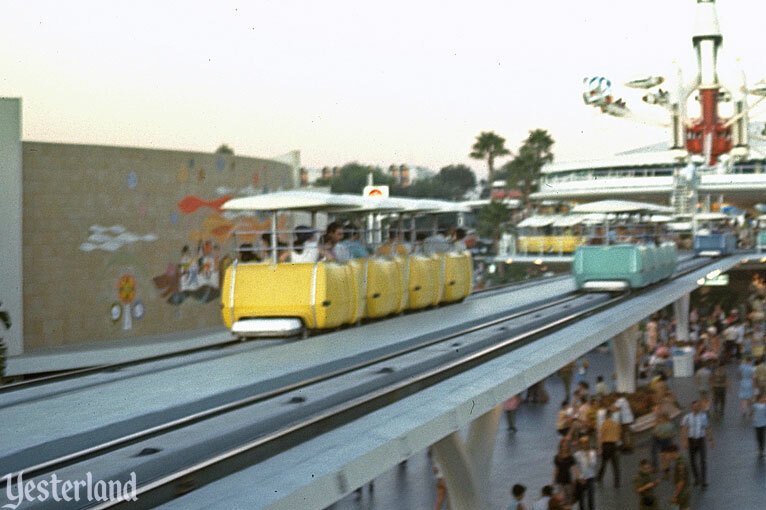 Did you ever ride the PeopleMover at Disneyland before it was axed in 1995? AB: Unfortunately, I never got the chance. My first trip to Disneyland was not until 2009, if you can believe it! I grew up on the east coast so my Disney elevated transportation of choice was the Tomorrowland Transit Authority. I used to call it “mini-Space Mountain,” when I was too young to ride the real Space Mountain, since it briefly goes through the attraction. 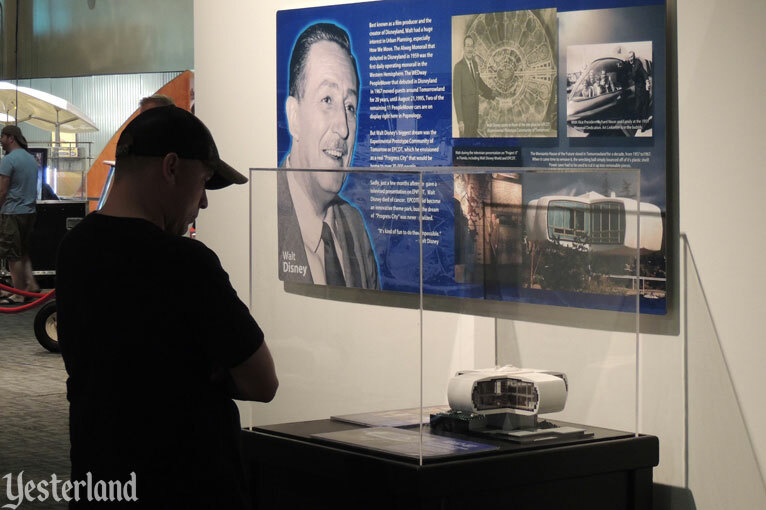 While I don’t have personal memories of the PeopleMover, reading websites like Yesterland, collecting vintage Disneyland ephemera, and spending time in Disneyland in recent years has given me an incredible appreciation for its past. I hope that someday Disney will take advantage of the existing guideway and bring the PeopleMover back so that I can ride it! Can we start a petition? 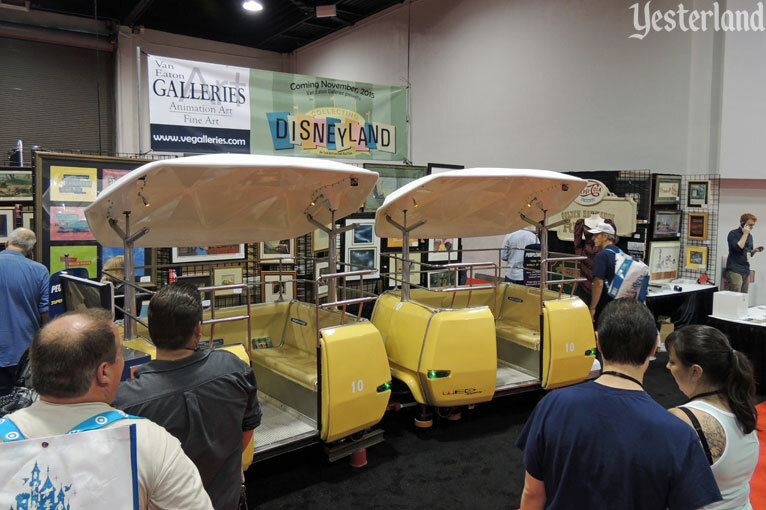 WW: The PeopleMover at Disneyland went uphill and downhill, looped around the Submarine Lagoon, and passed through the second level of the Carousel Theater building. It was more fun than its always-level counterpart in Florida, which goes around the outside of the single-level Carousel Theater there. The big advantage of the Florida version is that it’s still running. AB: I would agree that the better “people mover” is the one that you can actually ride! But Disneyland’s PeopleMover had so much more to offer. WW: Looking at your photos, there are LEGO pieces I’ve never seen before. Are these special pieces for advanced model builders? AB: The goal for all of my models is to use pieces that can be purchased online through LEGO’s Pick a Brick and Bricks and Pieces website. This way the models can be recreated by anyone, anywhere. 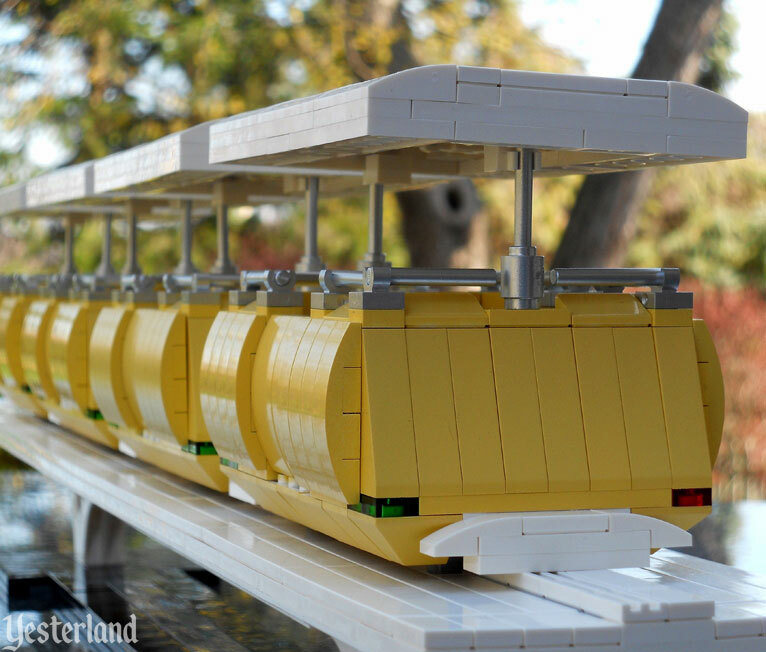 With that being said, this model pushed the limits of typical LEGO bricks! 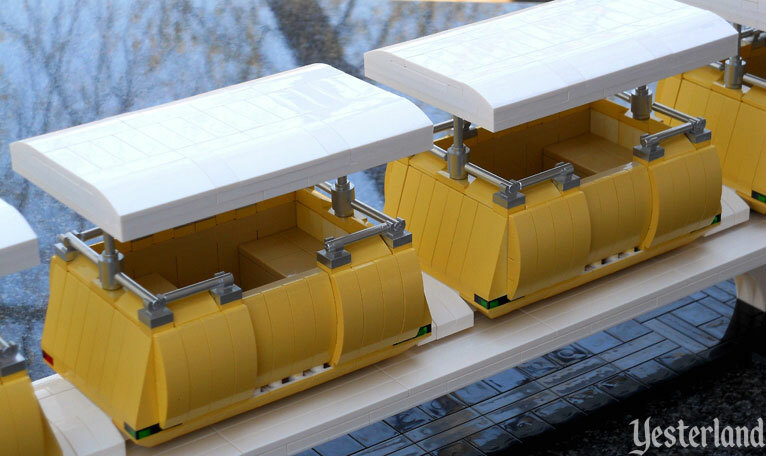 The modern, almost streamline, shape of the vehicles was a challenge to capture in LEGO form. I found myself deep in the LEGO archives. Some of the pieces have not been included in LEGO sets since the 1990s. Amazingly enough I owned some of these sets as a child and had the pieces on hand! Ultimately, I hope to have stayed true to the source material as well as the building material. I’ll let you and the readers decide! WW: What challenges did you have to deal with to complete your LEGO PeopleMover? AB: Like I mentioned before, the Disneyland PeopleMover is an icon. 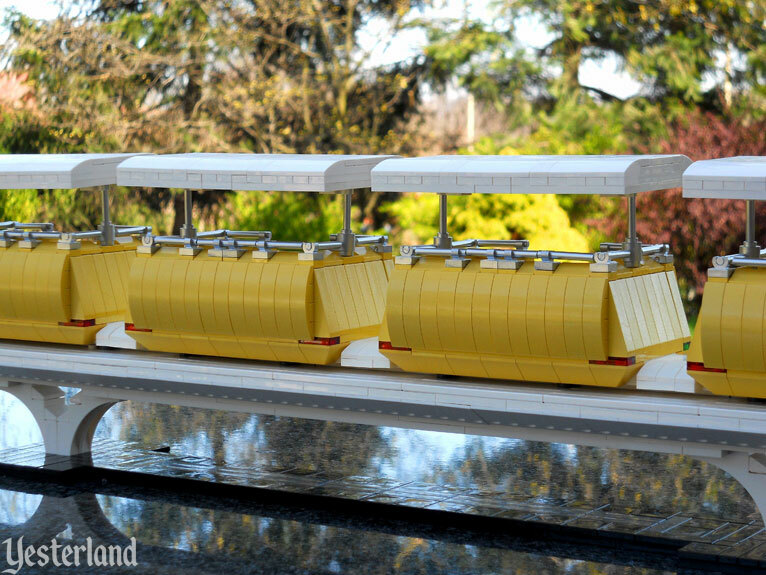 I knew the model would have to be instantly recognizable for it to give proper homage to the original attraction. This meant capturing as many of the contours, curves, ins, and outs of the vehicles and track as I could using LEGO, and doing it all in a scale that everyone could enjoy. I also wanted to include the ability to adjust the roof for loading and unloading which added a neat touch of authenticity and a bit of surprise to the design. 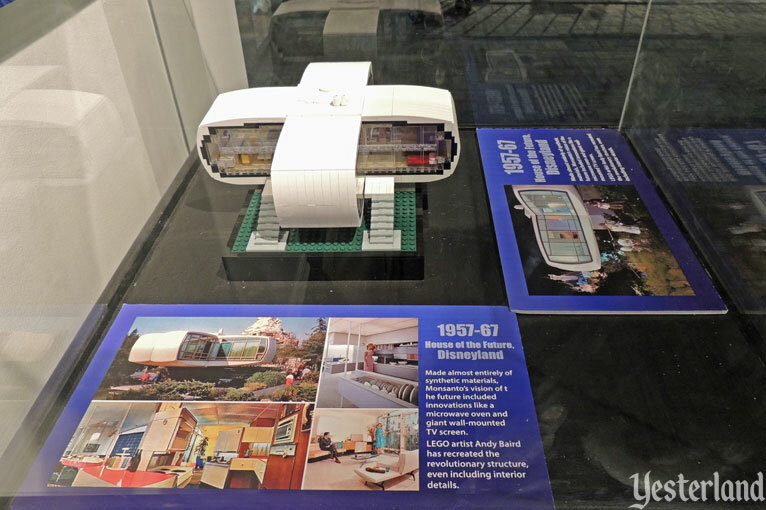 WW: Your LEGO House of the Future ended up at the Los Angeles County Fair. How was that experience? AB: I arranged to hand deliver the model from Pittsburgh since my fiancée and I had already planned a trip to Disneyland the week that they were setting up. As a Disney fanatic it was very cool to have the House of the Future model at Disneyland! The LA County Fair and POPnology exhibit were amazing! Michael Converse [LA County Fair exhibit designer] was nice enough to give my fiancée and me a personal tour. He has a great passion for history, innovation, and imagination. The LEGO House of the Future was so well received that Michael asked me to create another model for the 2016 fair. This year’s exhibit will focus on the history of sports, and the model will be a 10,000-piece LEGO replica of an ancient Greek Olympic stadium. Go check it out if you’re in Southern California this fall! 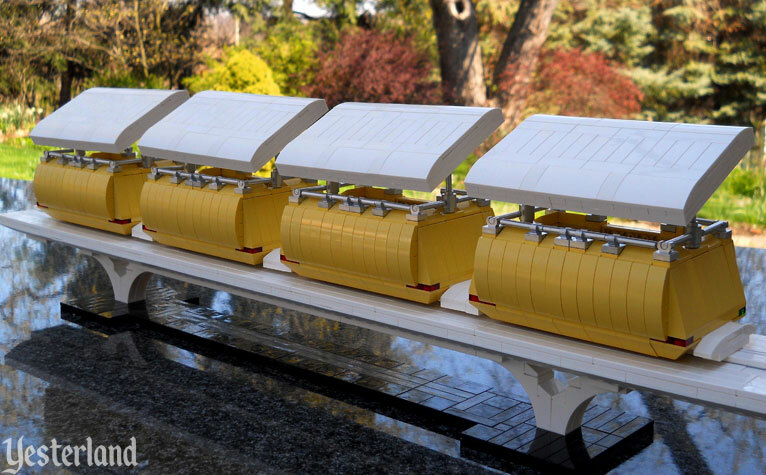 WW: Where is your LEGO House of the Future now? AB: The LEGO House of the Future is currently on tour with the POPnology exhibit. The exhibit is on display at the Arizona Science Center in Phoenix for the next few months before moving to its next location. I believe the exhibit will be traveling to New York for the summer before returning to California in the fall. You can check out the Stage Nine website for exact locations and dates. And I’d like to personally thank you and all of your readers for your support!